The Albany Leadership Charter High School for Girls currently leases the property at 19 Hackett Boulevard for use as a charter school and has entered into a real property purchase and sale agreement for acquisition of the property. With its financing in place to support the institution’s property acquisition, the Albany Leadership Charter High School for Girls can ensure the institution will not need to relocate in the future, supporting the retention of 57 full-time, and six part-time staff. On Thursday, the CRC board approved an application for assistance in the form of the issuance of tax-exempt bonds. The transaction brings $100,000 worth of investment to the City of Albany as the CRC board may utilize administrative fees collected as funding for future strategic initiatives. The CRC has utilized funds for multiple strategic community revitalization initiatives. Read more. A new $13.3 million hotel will be constructed at 351 Southern Boulevard, complementing 351 Diamond Development, LLC’s $10 million Mt. Hope Commons development currently under way at the 9W site. Made possible with support from the City of Albany Industrial Development Agency, Mukura Inc. plans to begin constructing a 60,000 sq. ft., four story Four Points by Sheraton hotel in May. The project will take what is currently a vacant 1.8 acre parcel and create 106 hotel rooms with an indoor pool, fitness room, a bar and lounge. The project will create 25 permanent jobs, and 100 construction jobs. Read more at CapitalizeAlbany.com. The first $21.5 million phase of a transformative $78 million investment in downtown Albany is under way beginning with the renovation of a vacant 112,000 sq. ft. office building, 16 Sheridan Avenue. Announced by Governor Cuomo in December — Redburn Development Partners will invest $78 million to renovate and rehabilitate seven prominent buildings in downtown Albany. Supported in part by the City of Albany Industrial Development Agency — the $78 million estimated project’s $21.5 million first phase will transform the former Knickerbocker News’ 16 Sheridan Avenue headquarters into ‘The Knick’ — 132 market-rate apartments and 3,500 sq. ft. of retail space planned for a restaurant. On Thursday the City of Albany IDA board approved an application to provide assistance to 16 Sheridan Avenue, LLC in the form of New York State sales tax exemptions. 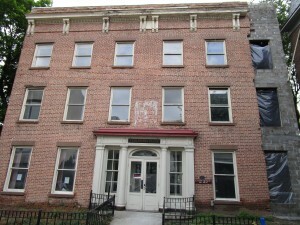 Redburn Development Partners is pursuing assistance from the City of Albany’s 485a tax abatement program. The project will create 12 permanent jobs and 130 construction jobs, interior demolition has started with construction to begin soon. Redburn Development plans to have the project at 16 Sheridan Avenue completed by fall 2019. Read more. An assemblage of property at the intersection of Sandidge Way (formerly Loughlin Street) and Fuller Road totaling 6.49 acres will be the site for construction of seven residential apartment buildings including a total of 252 apartment units. With this investment — the property will produce 4.47 times or more than $8.8 million more revenue generated to local taxing jurisdictions anticipated to have been collected without this new investment. Creating seven permanent and 165 construction jobs, during construction the project is estimated to generate a county-wide economic impact of more than $60 million and $1.5 million annually once completed. Read more. At its Thursday board meeting, the City of Albany Capital Resource Corporation (CRC) approved $25,000 more to support the Amplify Albany Grant Program. Administered by Capitalize Albany Corporation, the program is designed to create and expand programming that is driving foot-traffic throughout City neighborhoods and commercial districts. To date the City of Albany Capital Resource Corporation has invested $125,000 in this program — 30 grant awards totaling $94,083 has leveraged more than $290,000 in new or expanded programming investment and has supported foot-traffic of more than 25,000 participating in programming and attending events in neighborhoods throughout the City. Read more. An important element in Park South Urban Renewal Plan implementation, this $5.3 million investment will remove neighborhood blight through construction of a new five story building with 28 market-rate apartment units. Creating two permanent and 40 construction jobs — during construction the project is estimated to generate a county-wide economic impact of more than $7.3 million and $1.3 million annually once completed. The investment in the property will boost its revenue produced to local taxing jurisdictions more than eight times. Read more. A new $25.1 million investment will bring 74 affordable housing units, a primary care center and accessible services to 526 Central Avenue through partnership with Whitney Young Health and Equinox. The newly constructed 108,400 sq. ft. five story mixed-use development will strengthen the Central Avenue business district and support 47 permanent jobs and 65 construction jobs — during construction the project is estimated to generate a county-wide economic impact of more than $28 million and more than $5 million annually once completed. Over the next 30 years alone it will generate $5.5 million more in revenue to local taxing jurisdictions anticipated to have been collected without this new investment. Read more. 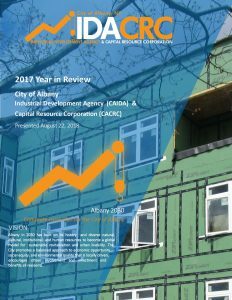 On August 22, the City of Albany Industrial Development Agency (CAIDA) and Capital Resource Corporation (CACRC) presented its 2017 Year in Review report to the Albany Common Council. This report was presented to the Council to highlight past projects and the organizations’ effectiveness fulfilling each entity’s mission and ensuring efficiency and transparency. Highlighted in this year’s report both the CAIDA and CACRC have assisted with the transformation of vacant, underutilized and/or tax-exempt properties into income producing properties. All 11 projects assisted by the IDA from 2015-2017 were previously vacant, underutilized and/or tax-exempt. Assistance by the IDA catalyzed more than $168 million in estimated capital investments from 2015-2017. Projects closed, between 2015 – 2017 alone are poised to generate more than $25 million to taxing jurisdictions over the term of their PILOTs — an increase of nearly five times the revenue anticipated to have been collected without these new investments. Furthermore, from 2015-2017, the IDA assisted projects that are expected to generate an estimated 651 construction jobs, 498 permanent or retained jobs and related indirect and induced investments. The CRC, from 2015-2017, assisted 6 civic facility projects that resulted in new or continued investments in the City of Albany of over $187 million. During that same time period, CACRC assisted projects are expected to generate an estimated 9,333 permanent or retained jobs. In 2017 the CAIDA and CACRC filed all appropriate reports and documents in a timely manner; all meeting schedules, materials and minutes were made publicly available on the albanyida.com website. The IDA compared favorably among its New York State counterparts across all indicators in the most recent New York State Comptroller’s report. A new $4.6 million investment is projected to create 55 jobs (52 constructions and 3 permanent), revitalize a historic building at the corner of Central Avenue and Lark Street that has been vacant for a decade, and bring new mixed-use development that will strengthen the Central Avenue business district and surrounding Lark Street commercial corridors. A project made possible with support from the City of Albany Industrial Development Agency, the City of Albany IDA board approved an application to provide financial assistance to West Mall Office Center, LLC in the form of New York State sales and mortgage recording tax exemptions. The project also qualifies for the City of Albany’s 485a tax abatement program — with the program’s completion, the property will generate more than $160,000 more for local taxing jurisdictions annually. Read more. A strong investment in the City of Albany’s economy is shown through the total value of projects that were catalyzed by assistance through the City of Albany IDA. Supported City projects in total were valued at $977 million, which is 51% greater than the average total investment created byDAs statewide (excluding NYC). Regarding payments in lieu of taxes (PILOTs) for the year, the City of Albany IDA facilitated $4.27 million of payments from projects to local taxing jurisdictions. On a per project level, the City of Albany IDA’s project exemptions are $70,216, which is $107,566 less per project compared to the statewide average. That is 60% lower than the average exemption per project on a statewide level (excluding NYC). The City of Albany IDA’s net tax exemptions were 86% lower per job gained than the average for IDAs statewide, this is without negatively impacting job creation numbers. Estimated net job changes from Albany IDA supported projects were shown to have a net job change of 5,139 — nearly three times the average for IDAs statewide. The City of Albany IDA also ranked favorably when measuring efficiency. In both expenses per job gained ($150) and expenses per project ($8,662) the IDA performed more efficiently, with lower expenses than the statewide averages by nearly $2,837 per job and $38,154 per project respectively. A new $10 million investment at 351 Southern Boulevard will create 60 jobs (30 construction and 30 permanent) and provide new neighborhood amenities. Portions of this project will have direct public infrastructure benefits. A new traffic light with a left hand turn signal will be installed to create a safer intersection for traffic and pedestrians. Sidewalks will be constructed along route 9W and Mount Hope Drive along the project’s perimeter. Two CDTA bus stops will be installed, enhancing bus transit access. Read more. In recent years, new investment has strengthened downtown Albany’s Broadway, today a walkable retail destination in the downtown core. The fabric of the downtown neighborhood continues to evolve as new retail and downtown living opportunities come online. Retaining Coulson’s News and Deli on its first floor, the renovation of 420 Broadway will transform the building’s currently underutilized upper floors into seven one-bedroom market-rate apartments. A project made possible with support from the City of Albany Industrial Development Agency, on Thursday the board approved an application to provide financial assistance to 420 Broadway Albany, LLC, in the form of New York State sales and mortgage recording tax exemptions. The project also qualifies for the City of Albany’s 485a tax abatement program — with the program’s completion, the property will generate more than four times the revenue to local taxing jurisdictions. Read more here. A redevelopment plan for Albany’s Playdium Bowling Center will reinvest $16.2 million into the 1.8 acre parcel located at 363 Ontario Street in Albany’s Pine Hills Neighborhood. The completed project will immediately double payments to local taxing jurisdictions, and is projected to generate $4.76 million in payments in lieu of taxes over the life of the PILOT. Based on the current assessment, the property would only have generated $1.13 million in taxes. The project will provide new neighborhood amenities, support eight permanent jobs and create an estimated 85 construction jobs. Construction could begin as early as this spring. Read more here. A new construction project at 760 Broadway will transform the vacant property, bring new revenue to Albany’s taxing jurisdictions and create a total of 88 new apartment units. Due to the discovery of site constraints during the project’s initial site work, design changes were needed and the project’s progress was delayed. The project is now expected to be completed in the fall of 2019. Read more. Home Leasing has committed to rehabilitating 210 units of housing in the Arbor Hill neighborhood and along Clinton Avenue and Ten Broeck Triangle. Local momentum caught the Rochester based developer’s attention, nearly 100 new affordable homes recently came online in Sheridan Hollow—implementation of a comprehensive neighborhood revitalization strategy redeveloped the Sheridan Hollow neighborhood into a mixed-use, mixed-income sustainable neighborhood of choice. New investment in downtown is building momentum and catalyzing further growth in surrounding neighborhoods. A project made possible with support from the City of Albany Industrial Development Agency, on Thursday the Board approved an application to provide financial assistance to Home Leasing in the form of real property tax abatements. Over the next 30 years, the properties are estimated to generate $2.56 million to the local taxing jurisdictions—for the past 11 years local taxing jurisdictions have received no property taxes. Click here for more information. With a current lower interest rate available, Albany Medical Center identified significant savings through the refinancing of its active civic facility revenue bonds that can serve the institution. The refinancing will save Albany Medical Center approximately $2.1 million over 30 years. Since 2010, the City of Albany Capital Resource Corporation (CRC) has served as a resource for Albany’s not-for-profits, which include anchor institutions like Albany Medical Center. In utilizing the local option, the City of Albany CRC, for the issuance of tax-exempt civic facility revenue bonds—Capital Region anchor institutions are investing back into the community. On Thursday, the CRC board approved an application for assistance in the form of the refinancing of Albany Medical Center’s previously issued 2006 and 2007 civic facility revenue bonds. The approved refinancing transaction involves the issuance of $41,515,000 total in bonds. The transaction brings approximately $100,000 worth of investment to the City of Albany as the CRC board may utilize administrative fees collected as funding for future strategic initiatives. Over the past two years, the CRC has utilized funds for multiple strategic community revitalization initiatives. Read more. 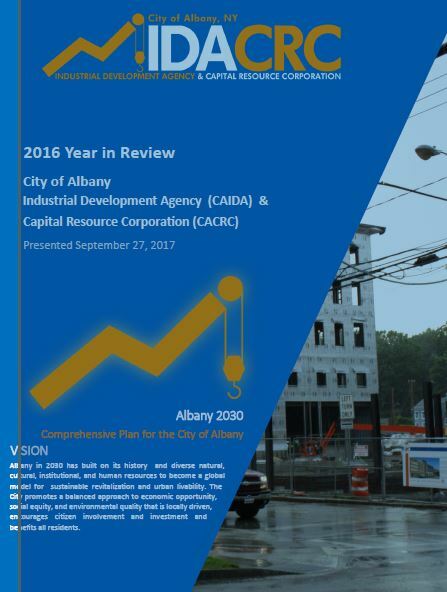 On September 27, the City of Albany Industrial Development Agency (CAIDA) and Capital Resource Corporation (CACRC) presented its 2016 Year in Review report to the Albany Common Council. This report was presented to the Council to highlight past projects and the organizations’ effectiveness fulfilling each entity’s mission and ensuring efficiency and transparency. Click here to read the full report. Highlighted in this year’s report both the CAIDA and CACRC have assisted with the transformation of vacant, underutilized and/or tax-exempt properties into income producing properties. All 23 projects assisted by the IDA from 2014-2016 were previously vacant, underutilized and/or tax-exempt. Assistance by the IDA catalyzed more than $292 million in estimated capital investments from 2014-2016. Projects closed, between 2014-2016 alone, are poised to generate more than $25 million to taxing jurisdictions over the term of their PILOTs. Furthermore, from 2014-2016, the IDA assisted projects that are expected to generate an estimated 1,258 construction jobs, 1,074 permanent or retained jobs and related indirect and induced investments. The CRC, from 2014-2016, assisted 6 civic facility projects that resulted in new or continued investments in the City of Albany of over $178 million. During that same time period, CACRC assisted projects are expected to generate an estimated 500 construction jobs and 739 permanent or retained jobs. In 2016 the CAIDA and CACRC filed all appropriate reports and documents in a timely manner; all meeting schedules, materials and minutes were made publicly available on the albanyida.com website. The IDA compared favorably among its New York State counterparts across all indicators in the most recent New York State Comptroller’s report. A 30-unit, 40,000 sq. 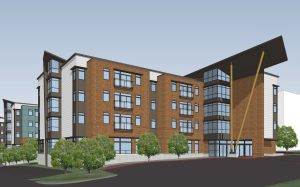 ft. apartment building will rise between New Scotland Avenue and Knox Street. This new construction project marks a significant Park South Urban Renewal Plan implementation milestone as redevelopment will spread beyond blocks east of where Albany Medical Center and Tri-City Rentals collaborated on 268 new market-rate apartments on Morris Street and Dana Avenue. A project made possible with support from the City of Albany Industrial Development Agency, on September 21 its board approved an application to provide financial assistance to RECKDE, LLC, in the form of New York State sales and mortgage recording tax exemptions and real property tax abatements. This $5.1 million project is estimated to create 35 construction jobs and completion is planned for mid-2018. Next year local taxing jurisdictions will receive more than double the taxes currently received. Over the next 20 years, the properties are estimated to generate $1,358,542 to the local taxing jurisdictions—an increase of more than $1 million or more than five times the revenue anticipated to have been collected without this new investment. Once its PILOT agreement concludes the project is projected to produce $196,923 in real property taxes annually. With a current lower interest rate available, Albany Law School identified significant savings through the refinancing of its active civic facility revenue bonds that can serve the institution. The refinancing will save Albany Law approximately $1.8 million over 20 years. Located in Albany’s Park South neighborhood, Albany Law School is one of the oldest independent law schools in North America with more than 160 years of experience in law education. Since 2010, the City of Albany Capital Resource Corporation (CRC) has served as a resource for Albany’s not-for-profits, including its world-class higher-education institutions. In utilizing the local option, the City of Albany CRC, for the issuance of tax-exempt civic facility revenue bonds—Capital Region anchor institutions are investing back into the community. On Thursday, the CRC board approved an application for assistance in the form of the refinancing of Albany Law School’s previously issued 2007 civic facility revenue bonds. The approved refinancing transaction will involve the maximum issuance of $14,000,000 in bonds. The CRC collects .25 percent on bonds refinanced through the Corporation and this transaction will bring $35,000 worth of investment to the City of Albany as the CRC board may utilize this funding for future strategic initiatives. Read more. A strong investment in the City of Albany’s economy is shown through the total value of projects that were catalyzed by assistance through the City of Albany IDA. Supported City projects in total were valued at $1.32 billion, which is 58% greater than the average total investment created byDAs statewide. Regarding payments in lieu of taxes (PILOTs) for the year, the City of Albany IDA facilitated $4.35 million of payments from projects to local taxing jurisdictions. On a per project level, the City of Albany IDA’s project exemptions are $83,116, which is $120,004 less per project compared to the statewide average. That is 59% lower than the average exemption per project on a statewide level. In relation to job creation, the City of Albany IDA’s net tax exemptions per job gained were also 79% lower than the average for IDAs statewide, and this is without negatively impacting job creation numbers. Estimated net job changes from Albany IDA supported projects were shown to have a net job change of 5,766—nearly 3 times the average for IDAs statewide. The City of Albany IDA also ranked favorably when measuring efficiency. In both expenses per job gained ($131) and expenses per project ($7,974) the IDA performed more efficiently, with lower expenses than the statewide averages by nearly $1,730 per job and $23,548 per project respectively. At its February board meeting, the City of Albany Industrial Development Agency Board approved an application to provide financial assistance to At Hudson Park, LLC, in the form of New York State sales and mortgage recording tax exemptions. The project is estimated to create 50 construction jobs and two permanent jobs. Led by Capital District Real Estate Investment Team, developers plan to maintain historic aspects of the site. The project will involve the redevelopment of the approximately 1.3 acre Long Energy properties into 75 market-rate apartment units. Currently the property consists of 44,378 square feet of warehouse and storage space and 13,523 square feet of office space with additional space for parking. The residential conversion will result in 10 one bedroom, 33 flats and 32 loft apartment units in addition to approximately 50 parking spaces on site. Read more. In October of 2016, the Community Loan Fund of the Capital Region (CLFCR) was notified that it had won a highly competitive $1.75 million grant from the U.S. Treasury Department’s CDFI Fund. The catch was that the award, which would primarily be used for lending capital, had to be matched dollar-for-dollar by the end of January 2017. With the help of the City of Albany’s Capital Resource Corporation (CRC), SEFCU, KeyBank Foundation, NBT Bank and many other organizations and individuals, the grant was matched in its entirety. The City of Albany CRC granted the Community Loan Fund $250,000 for its revolving loan fund under an agreement that dedicates leveraged funds 2 to 1 to projects in the City of Albany—making $750,000 in loans available to local small businesses and community development projects. In addition, KeyBank Foundation and SEFCU each granted $50,000, and NBT Bank granted $25,000. On January 26 the City of Albany Industrial Development Agency Board approved an application to provide New York State sales and mortgage recording tax exemptions to assist ValuSpace Albany, LLC in this project. This new construction project, a $6.3 million 90,000 sq. ft. high-grade three-story temperature controlled self-storage facility will contain approximately 650 storage units, a rental office and retail space for the sale of moving and packing supplies. Read more. The City of Albany Capital Resource Corporation (CRC) approved new small business programming in partnership with the Community Loan Fund of the Capital Region at its Thursday board meeting. The City of Albany CRC granted the Community Loan Fund $250,000 for its revolving loan fund under an agreement that dedicates leveraged funds 2 to 1 to projects in the City of Albany—making $750,000 in loans available to local small businesses and community development projects. The Community Loan Fund, a 501(c)(3) Community Development Financial Institution (CDFI) was chosen to receive a $1.75 million grant from the U.S. Treasury Department’s CDFI Fund. The award requires a dollar-for-dollar match enabling CDFI’s to leverage private capital. With the match required by January 15, the Community Loan Fund approached the City of Albany CRC for assistance at its December finance committee meeting to help secure those resources. Including the City of Albany CRC’s assistance, the Community Loan Fund has raised $1.5 million in capital to date and is in need of additional investment from the community in order to meet the $1.75 million match on time. The mixed-use conversion of the Nipper building (991 Broadway) in Albany’s warehouse district to 75 apartments and 7,750 sq. ft. of ground-floor commercial space is phase one of a planned four-phase, $70 million development project. 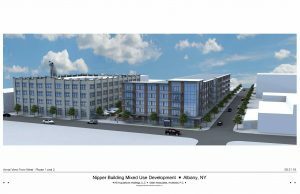 On Thursday, the City of Albany Industrial Development Agency Board approved an application to provide financial assistance to Nipper Apartments, LLC. in the form of New York State sales and mortgage recording tax exemptions. The project is estimated to create nearly 20 permanent and 70 construction jobs. The building’s first commercial tenant, announced in August, the Good Market is a modern day food hall inspired by the Ferry Building Marketplace in San Francisco, Chelsea Market in New York City and Reading Terminal in Philadelphia that will be located in the Nipper Building’s ground-floor space. Planning to open in late spring, the multi-vendor space will include businesses selling fresh meat, produce, baked goods, cheese, prepared food and more. Led by developer Bill Barber, in total the four phase plan will include approximately 150 additional apartments in a set of newly constructed buildings with retail space and multiple levels of indoor parking. Also making this project possible, Empire State Development Corporation granted the redevelopment project $500,000 as part of Governor Cuomo’s Regional Economic Development Council awards in Round VI. The Capital Region was a top performer—receiving $83.1 million in total—with City of Albany projects awarded $5.58 million. Complementing Nipper Apartments and creating an estimated 50 construction jobs, Barber’s redevelopment of nearby 960 Broadway is revitalizing a property formerly home to the Rodgers Liquor Co., which has been left vacant for two decades. Made possible by the City of Albany IDA, the 4-story abandoned warehouse will be converted into 24 market-rate apartments featuring ground floor restaurant space accessible from Broadway. Click here for an announcement press release and more information. WHEN: December 6, 2016 at 3:30 p.m.
A public information session regarding the City of Albany Industrial Development Agency’s Project Evaluation and Assistance Framework will be held on Dec. 6. City of Albany IDA applicants requesting deviations with applications deemed complete after January 1, 2017 will benefit from being analyzed through a Framework that adds a new level of transparency and predictability to the process. The Project Evaluation and Assistance Framework is designed to encourage catalytic commercial real estate investments in the City of Albany for project applicants seeking deviations from Uniform Tax Exemption Policy assistance. The Framework ensures that projects receiving assistance meet baseline requirements and have a significant impact on the local economy and positive benefit to the community. With assistance provided by the City of Albany Industrial Development Agency, a new owner will renovate the existing 136 units of section 8 affordable housing located at 2 Thurlow Terrace in Albany’s Washington Park neighborhood. The assistance also offsets costs, allowing Capital District Apartments, LLC to continue the property’s function as affordable housing. Nearing its expiration, through a new agreement the property will maintain its affordable housing status for the next 40 years. The 9-story 85,000 sq. ft. structure was built in 1979. Renovations will include needed repairs and updating many amenities for the safety and improved quality of life of its tenants. On Thursday, the City of Albany Industrial Development Agency board approved an application to provide financial assistance in the form of New York State sales and mortgage recording tax exemptions and real property tax abatements for the $21.6 million rehabilitation of 2 Thurlow Terrace, which will create 75 construction jobs. The assistance will ensure that the building remains affordable for the next 40 years, and does not affect the monthly payments for tenants due to City of Albany IDA assistance, but it will increase the revenue provided to Albany’s taxing jurisdictions by 30%. New construction projects located at 191 North Pearl Street and 760 Broadway will transform the two vacant properties, bring new revenue to Albany’s taxing jurisdictions and create a total of 118 new apartment units. On Thursday, the City of Albany Industrial Development Agency board approved applications to provide financial assistance in the form of New York State sales and mortgage recording tax exemptions and real property tax abatements for the development of the two groundbreaking new construction endeavors. 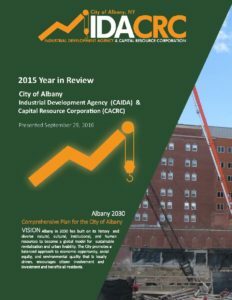 On September 29, the City of Albany Industrial Development Agency (CAIDA) and Capital Resource Corporation (CACRC) presented its 2015 Year in Review report to the Albany Common Council. This report was presented to the Council to highlight past projects and the organizations’ effectiveness fulfilling each entity’s mission and ensuring efficiency and transparency. “Supported by IDA assisted projects, the City of Albany is experiencing a great deal of momentum. These transformational projects are catalyzing continued capital investments and job growth,” said Sarah Reginelli, CEO of the Albany Industrial Development Agency and Capital Resource Corporation. All 27 projects assisted by the IDA from 2013-2015 were previously vacant, underutilized and/or tax-exempt. Assistance by the IDA catalyzed more than $344 million in estimated capital investments from 2013-2015. Projects approved in 2015 alone are poised to generate more than $7.5 million to taxing jurisdictions over the term of the PILOTs. Furthermore, from 2013-2015, CAIDA assisted projects that are expected to generate an estimated 1,502 construction jobs, 1,517 permanent or retained jobs and related indirect and induced investments. The CACRC, from 2013-2015, assisted 6 civic facility projects that resulted in new or continued investments in the City of Albany of over $140 million. During that same time period, CACRC assisted projects are expected to generate an estimated 400 construction jobs and 1,022 permanent or retained jobs. In 2015 the CAIDA and CACRC filed all appropriate reports and documents in a timely manner; all meeting schedules, materials and minutes were made publicly available on the albanyida.com website. The CAIDA, compared favorably among its New York State counterparts across all indicators in the most recent New York State Comptroller’s report. To view the announcement press release. click here. To read the 2015 report, click below. Aspen Albany is the newly constructed 277 room, four-story student housing facility at 1475 Washington Avenue. After breaking ground at the site of the project last summer, Aspen Albany has opened the doors for its first fall semester. City of Albany Mayor Kathy Sheehan was joined by GSX Solutions’ project team members, Aspen Heights management, and the City of Albany Industrial Development Agency in celebrating the completion and grand opening of Aspen Albany. The $28 million project created more than 200 construction jobs. A project made possible by assistance from the City of Albany Industrial Development Agency, the newly constructed Aspen Albany is a state of the art student residence offering features that provide student residents with a level of security, privacy, data connectivity, fitness facilities, environmental sensitivity, and sustainability that are unique to the Albany market area. 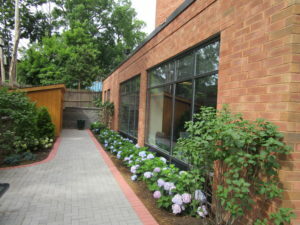 It is located in close proximity to Albany’s nearby world-class institutions and public transportation routes. Read more. Albany’s Sheridan Hollow neighborhood is undergoing an incredible transformation. Housing Visions Consultants, Inc. hosted a ribbon cutting ceremony marking the completion of construction of Sheridan Hollow Village, which will createed 57-affordable rental apartments for families and individuals. Sheridan Hollow Village is part of the comprehensive neighborhood revitalization strategy to redevelop the Sheridan Hollow neighborhood into a mixed-use, mixed-income sustainable neighborhood revitalization endeavor. Made possible by assistance from the City of Albany Industrial Development Agency, this project is in partnerships with Habitat for Humanity Capital District and the Touhey Home Ownership Foundation to effect broad change to the Sheridan Hollow community by creating opportunities for affordable new construction home ownership, quality rental housing, retail and commercial investments, streetscape improvements, enhanced public safety and public park restoration. All together, the project will create nearly 100 housing units, plus new commercial and office space for the neighborhood. To read more click here. Capitalize Albany Corporation joined Royce Mulholland, President and CEO of The Mulholland Group and Albany Mayor Kathy Sheehan along with City of Albany IDA board members, other state and local elected officials to celebrate the grand opening of Royce on the Park, a newly restored and upgraded senior and disabled community living apartment building located at 400 Hudson Avenue in ‪Albany’s Pine Hills neighborhood. A project made possible by City of Albany IDA assistance, the building when acquired offered 179 units, TMG added an additional three units along with renovating the property in order to bring the structure in line with today’s codes and standards. Read more. Chris Maddalone and Seth Meltzer of Maddalone & Associates are prepared to renovate 99 Pine Street’s upper floors, bringing approximately 35 new market-rate residential units to the heart of downtown Albany. The renovation and partial conversion will take place on the property’s third, fourth and fifth floors transforming old office space into residential units totaling 34,000 square feet. The building will maintain its current commercial tenants. In total the 5-story property on the corner of streets North Pearl and Pine consists of three buildings which have been combined internally over the years, totaling approximately 101,700 square feet composed of retail and office space. On June 16 the City of Albany Industrial Development Agency Board approved an application to provide New York State sales and mortgage recording tax exemptions to assist with the $6.7 million renovation and partial conversion of the property. Read more here. A strong investment in the City of Albany’s economy is shown through the total value of projects that were catalyzed by assistance through the City of Albany IDA. Supported City projects in total were valued at $1.39 billion, which is more than double the average total investment created byDAs statewide. Regarding payments in lieu of taxes (PILOTs), the City of Albany IDA generated $5.1 million, or 28% more payments to its taxing jurisdictions than its statewide counterparts. A 15% percent increase from payments received in 2013. On a per project level, the City of Albany IDA’s project exemptions are $152,176 less per project compared to the statewide average. That is 72% lower than the average exemption per project on a statewide level. In relation to job creation, the City of Albany IDA’s net tax exemptions per job gained were also 72% lower than the average for IDAs statewide, and this is without negatively impacting job creation numbers. Estimated net job changes from Albany IDA supported projects were shown to be much greater, with 5,318 jobs created – more than three times the average for IDAs statewide. The City of Albany IDA also ranked favorably when measuring efficiency. In both expenses per job gained ($129) and expenses per project ($6,604) the IDA performed more efficiently, with lower expenses than the statewide averages by nearly $4,000 per job and $31,000 per project respectively. Read the announcement’s press release by clicking here, or learn more at www.CapitalizeAlbany.com. The City of Albany Industrial Development Agency board approved an application to provide financial assistance in the form of New York State sales and mortgage recording tax exemptions and real property tax abatements for the development of a new private student dorm facility proposed by GSX solutions. The project will be located at 1385 Washington Avenue. The $30.5 million project will create nearly 100 construction jobs and complements a similar project being built at 1475 Washington Avenue, which broke ground last summer. A 7-year PILOT (payment in lieu of taxes) agreement was approved. Over the life of the PILOT agreement alone the project is estimated to generate $1,996,201 in real property taxes, an increase of $1,636,618 over the revenue anticipated to have been collected within the same timeframe had the project not been approved. Once the PILOT agreement concludes, the project is projected to produce $522,396 in real property taxes annually for the local taxing jurisdictions. Read the announcement’s press release by clicking here or learn more at www.CapitalizeAlbany.com. Capitalize Albany Corporation announced the launch of two groundbreaking grant programs to benefit the City of Albany’s various commercial districts and its downtown’s retail market. Funding for the two grant programs was made possible by the City of Albany’s Capital Resource Corporation. Learn more by clicking here. Yesterday the Steuben Street Market celebrated its grand opening inviting City leaders and stakeholders to participate in a formal ribbon cutting ceremony. With approximately 600 items on shelves, customers are seeing bread, fresh and frozen meats, dairy products, sandwiches, smoothies and other food items serving downtown visitors and the growing residential population. 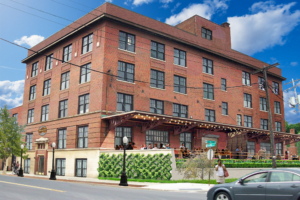 The Market is located on the first floor of the Steuben Place Apartments at 58 North Pearl Street, a $4.9 million mixed-use conversion project made possible by assistance from the City of Albany Industrial Development Agency, Capitalize Albany Corporation and New York State. Omni Development turned the vacant Class C office building into 29 studio, one bedroom and two bedroom units with ground-level retail space. To read more about the Steuben Street Market and its grand opening, visit Capitalize Albany Corporation’s website here. Previously a vacant property, Norstar Development invested more than $5 million in the project, with assistance by the City of Albany Industrial Development Agency, transforming the 45,000-square-foot, three-story building into a mixed-use space comprised of 29 one and two bedroom units and approximately 2,500-square-feet of ground floor retail space. 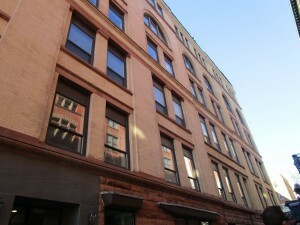 A formal ribbon cutting was held to celebrate the conversion and formal opening of The Lofts at 733 Broadway. For more information and photos, visit Capitalize Albany Corporation’s website here. The $4.9 million conversion at 40 Steuben Place transformed a vacant Class C office building into 29 studio, one bedroom and two bedroom units with ground-level retail space. A project made possible through City of Albany IDA assistance, the IDA provided New York State sales and mortgage recording tax exemptions and real property tax abatements. A formal ribbon cutting was held to celebrate the revitalization and formal opening of the Steuben Place Apartments. For more information, visit Capitalize Albany Corporation’s website here. Revitalization of the former DeWitt Clinton hotel is completed. 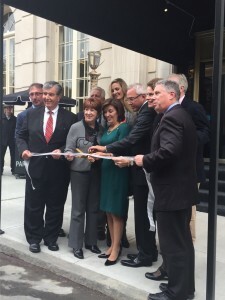 A ribbon cutting ceremony was held on October 21 and the Renaissance Albany hotel officially opened its doors. A project made possible through City of Albany IDA assistance, the IDA provided New York State sales and mortgage recording tax exemptions and real property tax abatements. For more information, visit Capitalize Albany Corporation’s website here. 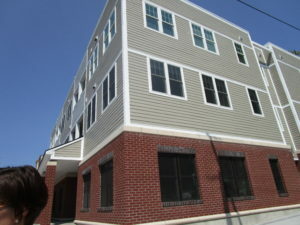 The now completed nearly $30 million project, transformed this property which was vacant for more than three years, into 103 new units of affordable housing in the City of Albany. A project made possible through City of Albany IDA assistance, the IDA provided New York State sales and mortgage recording tax exemptions and real property tax abatements. A formal ribbon cutting was held to celebrate the revitalization and formal opening of this historic property. For more information, visit Capitalize Albany Corporation’s website here. The City of Albany Industrial Development Agency is winding down implementation of its Strategic Transition Plan, which begun in February. The Plan, an effort to make policy and administrative enhancements to increase the Agency’s effectiveness and efficiency, was developed out of an internal assessment of procedures completed by Agency staff in late 2014. Announced today, the Agency shares recent results of the implemented Plan. Clawback Policy – A policy enabling the recapture of project benefits such as sales tax exemptions, mortgage recording tax exemptions and/or payments in lieu of taxes (PILOTs) when projects fail to deliver on projected public benefits such as job creation/retention. Project Monitoring and Enforcement Policy Update – A policy updated to monitor both the progress of projects towards meeting their projected public benefits and the accuracy of the Agency benefits provided. Conduct and Notifications of Public Hearings Policy Update – A policy updated to clarify and incorporate new policy and procedure requirements. In addition to these and numerous other policy and administrative updates, Agency staff is currently in the process of developing a project evaluation matrix to further enhance and standardize the application and deliberation process. To view the official announcement press release, click here. Yesterday, the City of Albany Industrial Development Agency (CAIDA) and Capital Resource Corporation (CACRC) presented its 2014 Year in Review report to the Albany Common Council. This report was presented to the Council to highlight past projects and the organizations’ effectiveness fulfilling each entity’s mission and ensuring efficiency and transparency. “The City of Albany is currently experiencing a great deal of momentum. We are seeing transformation taking place due to IDA assisted projects, catalyzing continued capital investments and job growth,” said Sarah Reginelli, CEO of the Albany Industrial Development Agency and Capital Resource Corporation. All 25 projects assisted by the IDA from 2012-2014 were previously vacant, underutilized and/or tax-exempt. Assistance by the IDA catalyzed more than $230 million in estimated capital investments from 2012-2014. Projects approved in 2014 alone are poised to generate more than $15 million to taxing jurisdictions over the term of the PILOTs. Furthermore, from 2012-2014, CAIDA assisted projects that are expected to generate an estimated 1,400 construction jobs, 1,170 permanent or retained jobs and related indirect and induced investments. The CACRC, from 2012-2014, assisted 5 civic facility projects that resulted in new or continued investments in the City of Albany of over $95 million. During that same time period, CACRC assisted projects are expected to generate an estimated 500 construction jobs and 79 permanent or retained jobs. In 2014 the CAIDA and CACRC filed all appropriate reports and documents in a timely manner; all meeting schedules, materials and minutes were made publicly available on the albanyida.com website. The CAIDA also outlined progress made on its 2015 Strategic Transition Plan to enhance operations. To see the official announcement press release, click here. To read the full 2014 Year in Review report, click below. At today’s board meeting the City of Albany Industrial Development Agency passed a resolution in response to a request for funding. The IDA pledged to fund up to $100,000 to support development of the Capital Region Economic Development Council’s regional growth strategy, which will be utilized to compete in Governor Andrew Cuomo’s Upstate Revitalization Initiative. The City of Albany Industrial Development Agency board approved an application to provide financial assistance to Cass Hill Development Cos. 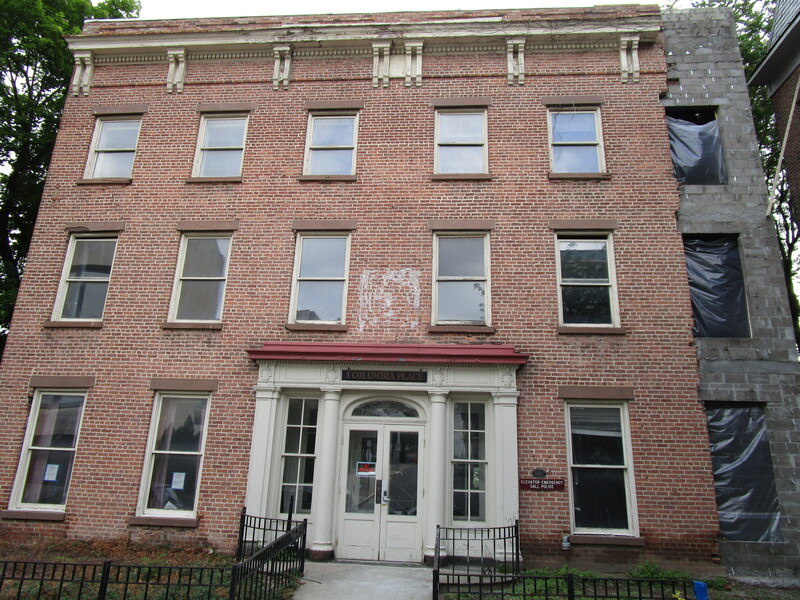 The IDA will provide New York State sales and mortgage recording tax exemptions and real property tax abatements to assist with the redevelopment of a vacant historic and dilapidated property which will be restored into 21 luxury market-rate apartments in downtown Albany. For more information about this project, visit Capitalize Albany Corporation’s website here. The City of Albany Industrial Development Agency found that the Agency compared favorably amongst its similar statewide counterparts according to the recent annual IDA performance report issued in May by State Comptroller Thomas P. DiNapoli. To read more, view the announcement press release here. The City of Albany Industrial Development Agency board approved an application to provide New York State sales and compensating use tax exemptions for a redevelopment project at 833 Broadway along the Broadway corridor of Albany’s warehouse district. To learn more about this project visit Capitalize Albany Corporation’s website here.